Despite a strong start, Tech faltered quickly against No. 3 Clemson, losing to the Tigers 49 to 21 on Saturday. Jordan Mason had a strong game, and Tech’s defense held remarkably well against Clemson’s killer combo of QB Trevor Lawrence and RB Travis Etienne, but against the best rush defense in the country, Tech’s triple option faltered, and the Jackets found themselves scrounging for points. QB TaQuon Marshall struggled early and often, rushing for just 47 yards on 25 carries while going 1/6 on passing, and the rest of the offense similarly faltered. Tech’s offense rises and falls with Marshall, and this was no less true on Saturday. Marshall started off strong, leading a deep drive to Clemson’s 16-yard-line to begin the game. But a fumble, sack and then a false start penalty set Tech back twenty yards and killed any momentum, as Tech was forced to punt on the drive. That set the tone for the rest of the game. Marshall averaged just 1.9 yards per rush attempt, the worst figure of his career since last year’s game against Clemson. Despite the bright start, Tech struggled and looked underprepared to face off against the nation’s best rush defense in the Tigers – Tech finished with just 146 rushing yards on 56 attempts. Marshall also posted a 57.3 passer rating with three sacks; Tech’s offensive line failed to protect Marshall frequently, and when Marshall could throw it, he was off target. In contrast to their recent struggles, Tech’s defense looked well prepared for Clemson initially: the Jackets limited starting Clemson QB Kelly Bryant to just 6/10 with 56 yards passing and five yards rushing as the Tigers scored only a defensive touchdown in the first quarter. But after Clemson head coach Dabo Swinney benched Bryant for freshman QB Trevor Lawrence, the Clemson offense found a rhythm, and finished with 248 yards rushing and 232 yards passing. Lawrence went 13/18 with 176 yards and four touchdowns, and RB Travis Etienne had a big game, rushing for 122 yards with a touchdown carry. 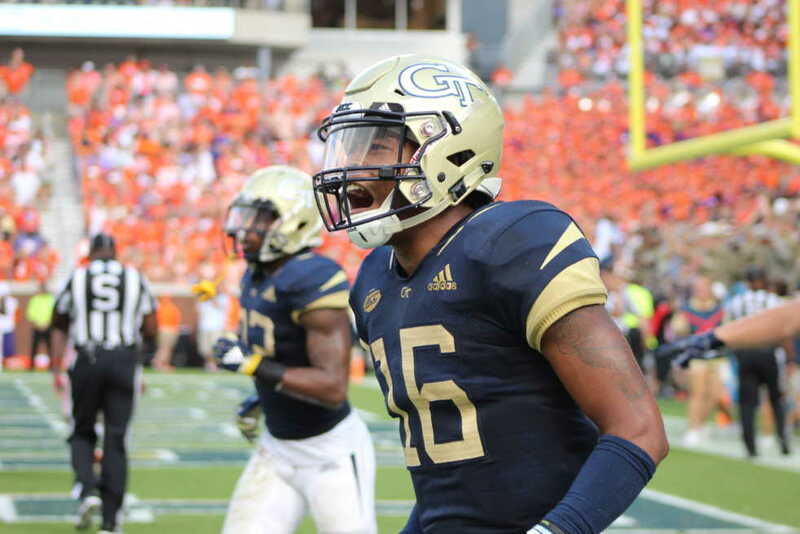 In the second half half, Tech’s defense crumbled even further, yielding 21 second half points and looking completely flummoxed – the Jackets operated without much rhythm or structure, and Clemson blew their coverage wide open. Overall, it was another poor showing for a defensive unit that looks to have more questions than answers. Tech’s streak of eighteen consecutive seasons making a bowl game appears even further in the rearview mirror now, as today’s loss sends the Jackets to 1-3 on the season. With three of their eight remaining games this season against ranked opponents and four on the road (where the Jackets have struggled), Tech has an uphill climb for a postseason bid. Of Tech’s remaining schedule, only two opponents – Bowling Green State and UNC – do not have records of .500 or better. Tech will need to scrape five wins out from a schedule that includes road games against no. 2 Georgia and no. 13 Virginia Tech.